PDF Mason, P. 2013. Intracultural & Intercultural Dynamics of Capoeira. Global Ethnographic. (2) the constructed teleologies about the vertical transmission of the art. Unpacking acts of myth-making at two levels of analysis reveals the interplay of discourse and repertoires of bodily expression. Class was in session. I was playing the atabaque drum—a freestanding upright leatherhead drum with a wooden body and a metal stand. To my right was a group of student musicians who were playing an assortment of percussion instruments. A student on the far end was playing the agogo cow bells and another was rhythmically running a stick across a wooden friction instrument called a reco reco. Next to them were two students playing samba-like tambourines called pandeiros. Between the pandeiro players and me were three students playing berimbaus, monochord, musical bows with gourd resonators affixed to one end. All these students were not participating in a typical music class. This was a training session of Capoeira, the Afro-Brazilian art of combat-dancing where music and dance fuse with martial arts. While some students were busy practicing on the musical instruments that comprise a Capoeira orchestra, others were learning the bodily movements of this holistic art. As I played the atabaque drum, I tried to take part in the vocal call-and-response songs being led by one of the berimbau players. We were singing a song distinct to the style of Capoeira we were practicing, Capoeira Angola. Other styles of Capoeira include Capoeira Regional and Capoeira Contemporânea. Singing and playing an instrument at the same time can be difficult. I struggled to maintain a steady rhythm on the drum. Several times, the teacher came over to correct my playing. She took over the drum and demonstrated the correct technique. I then attempted to copy her as best as I could. Playing only three drumbeats in time with several other musicians was harder than you would imagine. Believing I was off the beat, I stopped singing to focus on maintaining a steady rhythm on the drum. Despite my best efforts, the teacher came over again and again to demonstrate the rhythm. Her persistent intervention made me anxious about being off the beat. I paid close attention to her timing. I adjusted my playing accordingly. I concentrated on imitating her accurately. However, even when I imagined that I had corrected my timing immaculately, she came over yet again to demonstrate the rhythm. Her repeated instructions were a blatant indication that there was a crucial aspect of the musical aesthetic I was missing. Eventually, the teacher explained to me, “You are playing too Regional! In Capoeira Regional they play the drum like that, ‘bom BOM bom’. But, in Capoeira Angola we play it like this, ‘BOM bom BOM’.” In both examples, she struck the rim of the drum’s leather surface on the first and third strikes and the middle on the second strike. In her example of Capoeira Regional, transcribed in figure one, the first and third strikes were softer and the second strike was louder so that the sound went: ‘soft, loud, soft’. In her example of Capoeira Angola, also transcribed in figure one, the first and third notes were louder than the second strike: ‘loud, soft, loud’. The emphasis on the middle note in the Capoeira Regional rhythm created a mountain-like volumetric contour in the musical phrase. The volumetric contour of the Angola rhythm, in comparison, created a more steady pulse with two loud notes per cycle instead of just one. The Angola teacher was trying to highlight the steadiness of Angola music in comparison to the rising and stimulating inflections of Regional rhythms. Figure 1: Notation of a Capoeira Angola teacher ‘s rendition of the difference between a rhythm for Capoeira Angola and a rhythm for Capoeira Regional. The most curious part of this instruction was that Capoeira Regional orchestras do not actually feature a drum. This Capoeira Angola teacher had invented a picture of Regional drumming against which to articulate something about her own style. The volumetric contour of her Angola rhythm dipped while the volumetric contour of her representation of Regional rhythm peaked. The Angola rhythm was meditative and steady like a heartbeat while the Regional rhythm was uplifting and invigorating. Through a musical example, this teacher was expressing a stereotype of Capoeira Regional that I had heard her articulate in conversation in various ways at other times: “Capoeira Angola is low, protracted, and theatrical while Capoeira Regional is more upright, fast-paced, and martial.” This discourse oriented the horizontal transmission of bodily practices. Não deixe, rainha do mar Don’t let it happen, Queen of the Sea. Não deixe meu barco virar, Don’t let my boat capsize. As a female teacher, she wanted to move away from chauvinistic songs that often circulate in other Capoeira groups. Singing orations to the Queen of the Sea served to honour female role models while simultaneously proclaiming her group’s geographical location by the sea. After training sessions, the group would regularly discuss and reflect upon their practice. The uniqueness of their school was expressed and reinforced during discussions led by respected teachers. Highlighting similarity and difference between Capoeira groups was a strategic manoeuvre in the marketing of cultural skills. Teachers who wish to maintain and expand their student base need to market their particular skills and the distinctiveness of their group. Such discourses are especially obvious in instances when the image of the other is fabricated—an act illustrated by the representation of Capoeira Regional drumming by a Capoeira Angola teacher. Describing another group predominantly on the basis of stereotypes creates a perceived homogenisation of the out-group and catalyses homogenisation of the in-group. Students are encouraged to unify their shared practices and the representation of intra-cultural diversity is reduced. In-group favouritism and out-group derogation asserts common values among members, builds shared realities, and reinforces consensus. In a discussion of in-group and out-group dynamics, Richter and Kruglanski (2004: 104) have highlighted how the psychological need for closure is a key factor in the formation of stable cultural activity. They identify the need for closure as a motivational impulse that can elicit unmoving adherence to the most highly visible constructs centered upon pervasively accessible cultural norms and ideals. The accentuation of difference solidifies the group consensus and establishes a homogenising culture that is “secure, and thus appealing, to the group members who are high in the need for closure” (Richter and Kruglanski 2004:101). The need for closure in Capoeira comes from a desire to attract paying students as well as propel the genre in a manageable and marketable direction. When culture becomes a commodity the marketing of cultural skills becomes a carefully negotiated affair. At the horizontal level of transmission, discourses are created that orient physical articulations of identity. Interviews with revered Capoeira teachers (2009) at the Forte San Antonio in Salvador da Bahia—one of the biggest epicentres of Capoeira activity in Brazil—revealed wildly divergent views about Capoeira as a field of practice. Some Capoeira teachers suggested that there are as many styles of Capoeira as there are different schools, while others said that wherever there is a berimbau all Capoeira is the same. Capoeira teachers are driven by desires to promote their group, increase their class size, and potentially gain more cultural capital and monetary wealth. These desires and the competition between groups drives the psychological need for closure. In any one particular academy, the style of Capoeira performed is compelled by both teachers and a mixture of cultural forces to be recognisable, consistent and marketable. Centering a repertoire of body movement and musical aesthetics upon easily identifiable markers strategically catalyses centripetal in-group tendencies. Creating an ‘other’ of conflicting aesthetics fosters centrifugal out-group derogation. By accentuating the differences between groups and styles, strategically deploying images of the other, and establishing acceptable and unacceptable repertoires of music and movement, Capoeira teachers maximise the centripetal forces that impel their students towards a homogeneous standardised practice and minimise the centrifugal forces that may hurtle a group towards incommensurable heteroglossia. In Capoeira groups, like many social communities sustained by a common field of practice, esteemed practitioners can horizontally influence centripetal cultural forces. Teachers and students emphasise and sometimes fabricate in-group and out-group differences. In addition, practitioners also vertically promote the distinctiveness of their art by deploying origin myths and stories of lineage. These stories are marketing constructs but also orient students to distinct expressive corporeal practices. In the first section, we explored how music can be used to demarcate the exceptionality of a group. The next section focuses on movement and demonstrates that origin stories are creatively constructed and deliberately deployed. Nonetheless, these origin myths are deeply entangled with the physical play and musical accompaniment of Capoeira games. “Capoeira originated from African slaves brought by the Portuguese to Brazil four hundred years ago…” I still remember the story that one of my first Capoeira teachers recounted to many of his new students. He was from Bahia and he had taught Capoeira in England, France and Spain. The exact details of the story changed, but the central theme was always the same: Capoeira was the outgrowth of slavery and subversion. I knew the story well. As a young practitioner, I repeated the story myself many times and heard countless variations from other practitioners. Capoeira practitioners recount many versions of this story as part of the história da Capoeira without separating myth from history (D’Aquino 1983:97). Origin stories involving slavery and concealment do not perfectly correlate with existing historical evidence of the development of Capoeira. The musical and physical aspects of Capoeira have been continually contested among practitioners. From the few available sources, for example, the berimbau did not become linked with capoeira until at least the third quarter of the nineteenth century (Talmon-Chvaicer 2008:129). Until at least the mid-nineteenth century, the drum had been the musical instrument associated with capoeira (2008:31). The drum was pictured in paintings of foot-fighting (e.g. Earle 1822; Rugendas 1824), in the records of capoeira arrests (Talmon-Chvaicer 2008:31), and in tourist writings (Ribeyrolles 1941:38). As an act of oppression against expressions of African culture, Brazilian authorities put a ban on drumming in the early and mid-nineteenth century (Talmon-Chvaicer 2008:135). At least for a while, musical accompaniment for Capoeira did not formerly exist (Rego 1968:58). Up until the 1980s, the instrumentation used for Capoeira games was not fixed or consistent. The composition of the band had no specific arrangement in terms of their place or order in the circle (Talmon-Chvaicer 2008:132). Only in the twentieth century did the berimbau become steadfastly connected with capoeira (Ibid.). Origin myths subtend a certain kind of physical disposition in Capoeira games. Led by the berimbau, games of Capoeira are played by two practitioners at a time. Within a circular space called the roda, Capoeira performers search for spatial freedom while being physically challenged by an adversary. The story of disguising martial arts in dance is utilitarian to Capoeira teachers who wish to attract students, orient them towards the special kind of play found in the roda, and inspire them to embody a sense of freedom-searching integral to the movement repertoires of the art. The roda is a constrained environment. Searching for freedom in the roda means continually looking for uninhabited and danger-free spaces that are recurrently being opened and invaded. The search for freedom of the African slaves in the history of Brazil is a potent metaphor for Capoeira performers who search for physical freedom in the confining space of the roda. Stories of concealment promote the search for freedom and also propagate the Afro-Bahian mentality of subversion believed to have spawned from the slavery period. Such stories establish continuity with the past and serve the same ends as invented traditions which facilitate social cohesion and socialisation, and legitimise institutions, status, or relations of authority (Hobsbawm 1983:9). Teachers of martial arts establish the value and values of their discipline by recounting the virtues of predecessors (Green 2003:1). These historical narratives should be viewed “as consciously organised and utilised rather than invented” (2003:9). Issues of falsehood and truth can be reconciled by understanding that myth promotes a way of being in the world as opposed to an epistemic way of seeing the world (Daniel 1990:227-228; Lewis 1992:19). 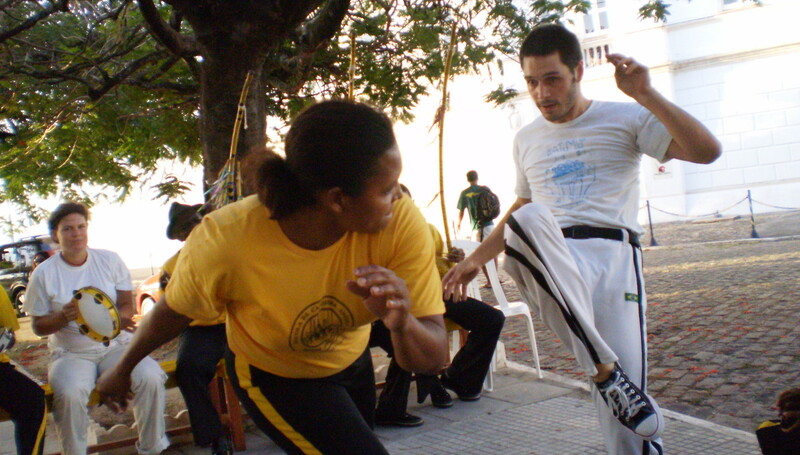 In Capoeira, the emphasis on foot techniques and the lack of hand assaults is often attributed to African traditions where “…the hands should be used for good work, i.e. creative activities, while the feet should be used for bad work, i.e. punishment and destruction” (Dawson 1993:13). However, the most iconic bodily movement of the Capoeira repertoire, an inverted spinning kick with hands on the ground, is not necessarily African in origin. This arcing kick is known as the rabo de arraia (stingray’s tail kick) or the meia-lua de compasso (compass half-moon kick) among other names. The rabo de arraia blends seamlessly with the base movement of Capoeira play, the ginga (see figure 2), and maintains the circular and flowing motion of physical interaction in the roda. The syncopated sway of the ginga keeps players in permanent motion, maintains their relationship with the music, and allows them to attack or defend at any moment. To perform the rabo de arraia from the ginga, “the attacker doubles over and places both hands on the ground. The attacker looks, upside down, between the legs and, as the body revolves on the pivot foot, swings the heel of the trailing leg out” (Downey 2005:235n2). The circular motion, mobile stability, and bodily inversion cement the rabo de arraia as a cornerstone of Capoeira technique. Figure 2: Typical foot placement of the Ginga, the basic swaying movement of Capoeira. The weight of the practitioner is maintained on the front foot and the ball of the back foot. Music and dance rarely leave a historical record, but an inverted spinning kick with hands on the ground is described in nineteenth century accounts of French Boxing (Charlemont 1877; Charlemont 1899). Nineteenth century descriptions of Capoeira mention foot-fighting and open-hand fighting (e.g. Wetherell 1856 quoted by Assunção 2005: 101), but no description of anything like the rabo de arraia. Versions of this inverted kick appeared in French paintings, such as an 1857 picture of boxing practiced by the French army on board a ship (figure 3) as well as in other drawings of the period (Loudcher 2000). Nineteenth century paintings of Afro-Bahian fighting by Augustus Earle (figure 3) and Johann Moritz Rugendas (1824), among others, only depict fighters executing ginga-like movements (Assunção, 2005:100-101). No paintings of Afro-Bahian fighting from this period depict the rabo de arraia. Archaic forms of the rabo de arraia and meia-lua de compasso are only seen in later pictures found in Burlamaqui (1928:24) and da Costa (1962:73-74). The rabo de arraia could very well have travelled from French boxing into Capoeira. Nineteenth century French travellers showed interest in the covert and public fighting activities in Brazil (e.g. Allain 1886:271-272; Itier 1853:62; Ribeyrolles 1941) and French sailors were among those who were arrested for Capoeira (Holloway 1989:658; Soares 2001). ‘Capoeira’ in the nineteenth century referred to ruffians, vagabonds, and gangsters who frequented wharf areas and had a strong association to the world of sailors (Dias 2006: 41, 83, 96-97, 195; Downey 2002:5; Leal 2008:63). If an inverted spinning kick was imported from French boxing into Capoeira, then it is because the circular motion, stability and inversion allowed it to be integrated with other movements of a circular nature. This arcing kick also proved highly compatible with the musical-movement relationships that developed within twentieth century Capoeira. Capoeira is an amalgamation of many, sometimes disparate, elements that were brought together in Brazil. Yet, stories of origins tend to be Afrocentric (Thompson, 1988; Thompson 1991; Dawson 1993; Dossar 1992; Kubik 1979; Kubik 1986; Desch-Obi 2000) with many practitioners and authors determining Capoeira to be an import from enslaved Africans, usually making special note of the Bantu people of Angola (Desch-Obi 2002:361; Lewis 1992:20; McGowan and Pessanha 1998:119). Stories of the African origins of Capoeira have been deployed throughout the twentieth century to various ends. Brazilian authorities stimulated the Afrocentric perspective as a means to empower self-determination among Afro-Brazilians. Afrocentric essentialism also facilitated the economic development of Brazil with a newly independent black Africa (dos Santos 1998:121). African origin stories have also attracted scholars of African diasporas who have found Capoeira a rich field of human activity in which to invest their theories. In talking about the African elements of capoeira, one has to be careful to avoid the metonymic fallacy where practices from an African village, town, or region are used to represent African-ness as a whole (Agawu 1995:384-385). Furthermore, anyone who understands African-ness as only being the trace of individual communities in West Africa misunderstands the Africans’ and Afro-Brazilians’ aesthetic and the cosmopolitan-ness of West Africa. The idea that unchanged elements of Capoeira are the most ‘African’ misrepresents the innovativeness and vitality of African music and dance traditions. Definitions of ‘Capoeira’ in Brazil have shifted over time. In the nineteenth century, Capoeira referred to urban thugs and gangsters. The ‘Capoeira’ that newspapers and police reports mentioned in the early nineteenth century was not the Capoeira of today. Capoeira was a much more diverse practice, including not simply dances and challenge games, but also stone-throwing, knife-fighting, skirmishing with police, and a host of other urban ruffian forms of sorting out disputes, resisting authority, and passing time. The domestication of Capoeira began with repression by authorities in the nineteenth century. In the twentieth century, Capoeira became a musical fight-dance associated with folklore performances. As an expression of folklore, Capoeira pays homage to the history of slavery in Brazil through the integration of musical and physical activities that have come to be associated with Afro-Bahian history and identity. Practically speaking, the incorporation of music and the development of dance within Capoeira would have sorted out the most violent expressions of Capoeira as the movement and game increasingly succumbed to the rhythms of the orchestra and the surveillance of respected teachers. By the end of the twentieth century, a culturally stable musical-movement practice eventually emerged that was so compelling and consistent that, instead of being persecuted, it became an international export. Lewis (1992) and Downey (2005) maintain a healthy suspicion of narratives that claim slaves brought Capoeira to Brazil from Angola. Indeed, the argument that music was used to conceal pugilistic training does not hold up to detailed analysis. Music would only serve to draw attention to an art form that contained kicks, sweeps, and headbutts. The practice of martial arts is better hidden by silence and secrecy than by an indexical noise and publicity. The kicks and sweeps of Capoeira are dance-like, but they are also blatantly combative and no amount of music could mislead a viewer to believe otherwise. Refuting the logic that music was used to conceal pugilistic training allows us to understand that origin myths promote the cohesiveness of the art and act as a counterpart to the physical activity of Capoeira play. At both the horizontal and vertical levels of transmission, instructors strategically organize and deploy artificial cultural representations to promote the cohesion, coherence, and consistency of their embodied field of practice. Agawu, K. 1995. The Invention of ‘African Rhythm.’ Journal of the American Musicological Society, 48(3), 380-395. Allain, E. 1886. Rio de Janeiro, quelques donnees sur la capital et sur l’administration du Bresil, Paris. Assunção, M. R. 2002. Capoeira: The History of an Afro-Brazilian Martial Art. Routledge, Great Britain. Burlamaqui, A.l 1928. Ginástica nacional (capoeiragem) methodizada e regrade, Rio de Janeiro: mimeograph. Charlemont, J. 1877. La boxe Française : Traité théorique et pratique. Charlemont, J. 1899. La Boxe Française : Historique et biographique, Paris. Da Costa, Lamaratine Pereira. 1962. Capoeira sem mestre, Rio de Janeiro: Edicoes de Ouro. D’Aquino, I. 1983. Capoeira: Strategies for Status, Power and Identity. Unpublished thesis at the University of Illinois. Daniel, E.V. 1990. Afterword: Sacred Places, Violent Spaces, In Jonathan Spencer (ed) Sri Lanka: History and the Roots of Conflict, New York and London: Routledge, 227-246. Dawson, D. 1993. Capoeira Angola and Mestre João Grande: The Saga of a Tradition; the Development of a Master, New York, N.P. Desch-Obi, T. J. 2000. Engolo: Combat Traditions in African and African Diasporas History. PhD thesis, University of California, Los Angeles. Desch-Obi, T.J. 2002. Combat and the Crossing of the Kalunga. In Linda M. Heywood (ed) Central Africans and Cultural Transformations in the American Diaspora. Cambridge University Press, 353-370. Dias, A.A. 2006. Mandinga, Manha and Malicia: Uma historia sobre os capoeiras na capital da Bahia (1910-1925), EDUFBA. Dossar, K. 1992. Capoeira Angola: dancing Between Two Worlds. Afro-Hispanic Review 11(1-3), 5-11. Downey, G. 2002. Domesticating an Urban Menace: Reforming Capoeira as a Brazilian National Sport. The International Journal of the History of Sport, 19(4), 1-32. Downey, G. 2005. Learning Capoeira: Lessons in Cunning from an Afro- Brazilian Art. Oxford University Press, New York. Green, T.A. 2003. Sense in Nonsense: The Role of Folk History in the Martial Arts, In Thomas A. Green, Joseph R. Svinth (eds), Martial Arts in the Modern World, Praeger Publishers, 1-12. Hobsbawm, E. 1983. Introduction: Inventing Traditions, in Eric Hobswawm and Terence Ranger (eds), In The Invention of Tradition, Cambridge University Press, 1-14. Holloway, T.H. 1989. A Healthy Terror: Police Repression of Capoeiras in Nineteenth-Century Rio de Janeiro. Hispanic American Historical Review, 69(4), 637-676. Itier, J. 1853. Journal d’un voyage en Chine en 1843, 1844, 1845, 1846, volume 1, Paris. Kubik, G. 1979. Angolan Traits in Black Music, Games, and Dances of Brazil: A Study of African Cultural Extensions Overseas. Lisbon: Centro de Estudos de Antropologia Cultural. pp. 7-55. Kubik, G. 1986. Afrikanische Musiktraditionen in Brasilien. In T.P. De Oliveira (ed.) Einführung in die Musiktraditionen Brasiliens. Mainz: Schott, pp. 124-127. Leal, L. A. P. 2008. A politica da Capoeiragem: A historia social da capoeira e do boi-bumba no Para Republicano (1888-1906). EDUFBA. Lewis, J.L. 1992. Ring of Liberation: A deceptive discourse in Brazilian Capoeira. University of Chicago Press, Chicago. Loudcher, J-F. 2000. Histoire de la Savate, du chausson et de la boxe Francaise (1797-1978) D’une pratique populaire a un sport de competition, L’Harmattan. McGowan, C., Pessanha, R. 1998. “Bahia of All the Saints” from The Brazilian Sound: Samba, Bossa Nova, and the Popular Music of Brazil, New Edition. Philadelphia: Temple University Press, pp. 116-137. Rego, W. 1968. Ensaio Socio-etnografico de Capoeira. Salvador, Bahia, Editora Itapoa. Ribeyrolles, C. 1941. Brasil Pitoresco: Historia, descricoes, viagens, colonizacao, instituicoes. Translated by Gastao Penalva, Sao Paulo: Editora da Universidade de Sao Paulo. Richter, L., Kruglanski, A.W. 2004. Motivated closed mindedness and the emergence of culture. In M. Schaller M, C.S. Crandall (eds), The Psychological Foundations of Culture. Mahwah, NJ: Lawrence Erlbaum Associates, 101–121. Soares, E. 2001. A capoeira escrava e outras tradições rebeldes no Riode Janeiro. 1808-1850. Editora da Unicamp, Campinas, São Paulo. Talmon-Chvaicer, M. 2008. The Hidden History of Capoeira: A collision of cultures in the Brazilian Battle Dance. University of Texas Press. Thompson, R. F. 1988. Capoeira. New York Capoeira Foundation. Thompson, R.F. 1991. Dancing Between Two Worlds. Kongo-Angola Culture and the Americas. African Diáspora Institute, New York. The Portuguese term história can translate to both ‘history’ and ‘story’, although other terms also exist for the latter. Descriptions of an inverted spinning kick with hands on the ground appeared in nineteenth century accounts of French Boxing, once a mandatory part of French military training called Savate (e.g. Charlemont 1877; Charlemont 1899). For those in the navy, the most effective kick was performed with hands on the ground and a leg extended at an opponent. Entailing a powerful strike with the foot, this kick gave sailors more balance and stability on a rocking ship. Charlemont (1899), who had been part of French regiments as early as 1856, described the kick to consist of actively carrying oneself forward, placing hands on the ground, turning the back to the adversary and launching a foot into the stomach. Manuel dos Reis Machado, an early proponent of Capoeira popularly known as Mestre Bimba, possibly learnt the inverted spinning kick from sailors during his teenage years while working as a stevedore in the harbour, or from his father who was a famous champion of a form of foot-fighting called Batuque (Assunção 2005: 132). In press interviews, Bimba explained that he had incorporated movements from various arts including batuque and French savate (Ibid.). Bimba’s students, notably Iapoan and Jair Moura who were swept up by the wave of nationalist and Afro-centric discourse of their generation, insisted on the paramount contribution of Batuque and de-emphasised the input of non-Brazilian movements (Ibid.). Batuque is the name of a popular nineteenth century Afro-Brazilian kicking game denominated as an ancestor to Capoeira (Carneiro 1965; Leal 2008:225). An early proto-form of French boxing was an eighteenth century game called Jeu bas de Batuque and was played by the sailors of Marseilles. Like Capoeira, Jeu bas de Batuque was reputed for its free-handed high turning kicks, head butting, elbowing and grappling. According to Charlemont (1877), practitioners attacked with a series of turning kicks that most of the time glided past their target. Charlemont likened this game from Marseille to gymnastics, dancing, and clownery; he did not recognise it as combat or as defense. Descriptions of capoeira similarly abound with claims that it is dance, gymnastics, and even a form of vadiação (loitering/vagrancy). As French boxing has evolved into a sport called Savate, the inverted spinning kick has been forgotten in the midst of competition rules that preclude its usefulness. The inverted spinning kick has, however, maintained its popularity in the art of Capoeira.